It is very true that a Chapter 7 bankruptcy case can be filed without having the full attorney fees paid up front. In fact, there are some attorneys that are willing to advance even the filing fees in certain circumstances. However, for a valid Chapter 7 bankruptcy case to be filed, there are certain documents and prerequisites that must be satisfied. For example, before any Chapter 7 bankruptcy case can be filed, absent exigent circumstances, the debtor must complete a credit counseling session from an office or agency approved by the executive office of United States Trustees. This session could last anywhere from one to two hours, with a cost of approximately $10-$50 and it must be completed within 180 days prior to the date of filing. There are some circumstances or situations where the credit counseling session cannot be taken for special circumstances. In those cases, if the debtor or counsel can prove that the credit counseling was not feasible to be taken prior to filing, the court may grant some leeway. However in 99.9% of all Chapter 7 bankruptcy cases filed, the credit counseling must be completed prior to filing. The debtor must sign all of the required documents which accompany the bankruptcy petition. This involves numerous signature pages correlating to numerous sections of the petition. The debtor has the obligation to review those documents with counsel and then to sign once said review is complete. The debtor cannot sign blank documents or documents which have not yet been prepared and reviewed. Further, the debtor must provide two months of pay advices and at least one year of federal tax returns when filing Chapter 7. Some Chapter 7 panel trustees are requesting two years’ worth of federal income tax returns, two months of pay advices as well as bank statements covering the time when the case was filed. These stricter trustees are becoming more and more common in the Northern District of Illinois. 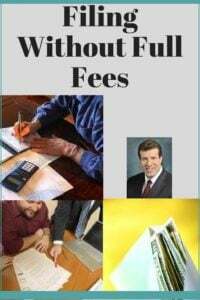 Thus, while you may be able to get a break on attorney’s fees and court costs prior to filing, you still need to complete the credit counseling, review and sign the documents prepared by your attorney and appear at a Section 341 meeting of creditors. The other documentation could be provided slightly after filing, but in enough time that your attorney can provide those items to the Chapter 7 panel trustee. So simply being filed early without full payment is not the whole situation. It is never quite that simple. However, if you hire good counsel and you heed the advice of that counsel, you stand a great chance of success in your Chapter 7 bankruptcy case. The take away from this blog is simple. You may file a bankruptcy case under Chapter 7 without having paid attorney fees and sometimes even the court costs in full. However, there are some things that you must do, that you must review and that you must sign prior to filing. Filing bankruptcy is a serious undertaking. Be sure to provide detailed, truthful information to your attorney so that the proper documents and the proper chapter of bankruptcy can be filed. If you do not tell your attorney everything, you are likely going to run into problems with your case. Don’t let this happen to you. Make a determined effort to provide your attorney with even more detail than you think might be necessary. If you do so, your attorney will be able to provide you with more comprehensive advice and a better plan to help you go forward.